Give something particularly valuable as a gift, give recreation! 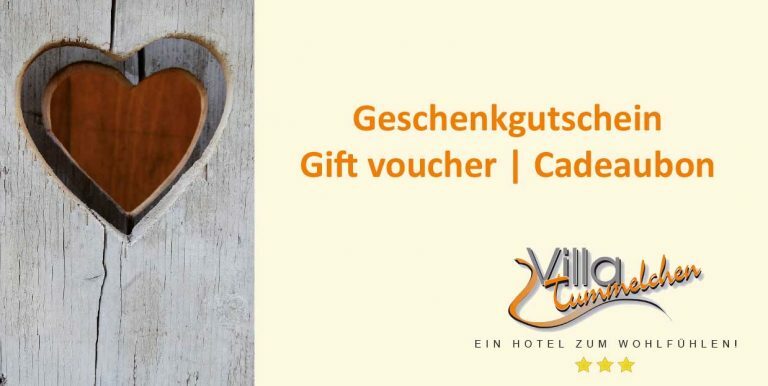 The somewhat different gift – Give a gift voucher from the Hotel Villa Tummelchen. The voucher will then be redeemed during a visit to our hotel. On receipt of this message, we will send you the invoice for the voucher. As soon as the invoice has been paid, we will send you the voucher by post. If you need the voucher urgently, Last Minute, we will be happy to send you the voucher by e-mail. The voucher can only be redeemed in our house. A cash payment is unfortunately not possible. No room has been booked with this voucher. You can book a room according to your wishes by phone or here on our website at “Online Booking”.